Get ultra-flexible manuals/auto fading functions, solo and channel flash, dimmer control, and more with the Behringer Eurolight LC2412 DMX Lighting Controller. 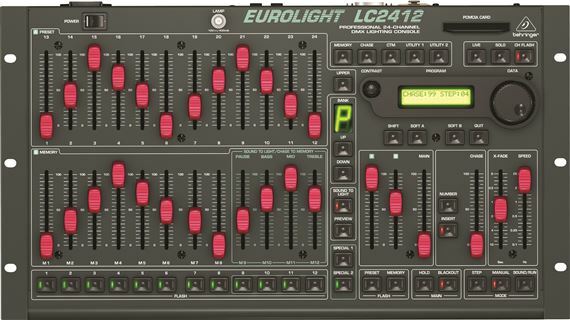 The Behringer Eurolight LC2412 DMX Lighting Controller provides 24 preset channels, which are assignable to 512 DMX channels, freely assignable crossfade times, 120 scenes, 10 banks, and an integrated chaser with up to 650 steps. You get ultra-flexible manuals/auto fading functions, solo and channel flash, dimmer control via DMX or analog output (0/+10 V) plus a MIDI interface for cascading of two LC2412s (master/slave setup). A PCMCIA card slot lets you store up to 25 complete settings (PCMCIA card not included). For added comfort, the LC2412 has an illuminated display/controls and BNC lamp socket for easy operation in dark stage environments. The Behringer LC2412 lighting controller rugged steel casing ensures long life even under the most demanding conditions. A rackmount kit is included. Physical quality of the LC2412 is very good. Faders work well but the spring loaded buttons could be better. The memory saving feature is outstanding which makes the memory and chase combinations tremendous. This unit has the most available features for a lighting mixer in this price range. 26 channels are directly available from the console. Easy to use live or using MIDI control. This unit has more features that the novice will know what to do with. Not as advanced as what is necessary for most multichannel DMX fixtures but works great for 1 or 2 channel DMX devices, especially DMX Dimmer Pack/PAR Can configurations. Certain portions of the manual can be difficult to understand at times but overall it covers everything you'll need to know about the device.